He was born on September 22 (October 5, New Style), 1908 in a. Urda Dzhanybek region of the Ural region in the family of a poor herdsman. He studied at the Russian-Kazakh aul elementary school, then in the Orenburg Kazakh folk and educational institute. In 1932 he graduated from Kazakh Pedagogical Institute, in the same year Zharok - Secretary of the Union of Writers of Kazakhstan, Kazgoslitizdata editor, deputy editor of the newspaper "Kazakh әdebieti." 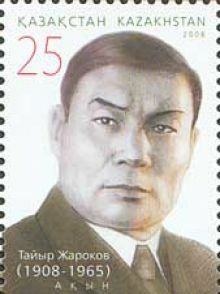 In the years 1938-1942 - the literary secretary of the national bard Zhambyla Zhabayev. Member of the CPSU since 1939. Is a member of the Great Patriotic War. Died March 11, 1965 in Alma-Ate.Pohoronen at the central cemetery of the city of Alma-Ata. He was first published in 1927. His first poem, "And laughs golden sun" Zharok published in 1927 in the collective book "Gift of Poetry," and in 1928 was published another poem "Airplane." In 1931 he co-authored with sagyr Kamalov wrote the play "A bloody stick." His first collection of poems of the poet, "Shining Star" was released in 1932. In the poems Zharokov "The sun began to speak" (1934), "Flow" (1937), "The forest rustled in the desert" (1949), "Steel, born in the desert" (1954), "The Storm in the desert" (1957) reflects the spirit of the Soviet reality. He was awarded the Order of the Red Banner (1959) and "Badge of Honor" - 1939, as well as medals.